Can a cabinet reshuffle develop the country that couldn’t be done by a government change? “Could a cabinet reshuffle develop the country that couldn’t be done so by a government change? As such, this is only a pseudo play act of Ranil; – Maithri administration. For the last few weeks the topic of the media was the cabinet reshuffle. This did override genuine issues of the people. The cabinet reshuffle was brought in to deceive the masses. As such, instead of taking the country forward this would create several crises in the country. Hence, these rulers, with the policies they follow, can no longer take the country or the people forward. Now, the country needs a change in policies. We call upon the people in this country to come forward for such a change,” says the Leader of the JVP and Chief Opposition Whip Anura Dissanayaka. 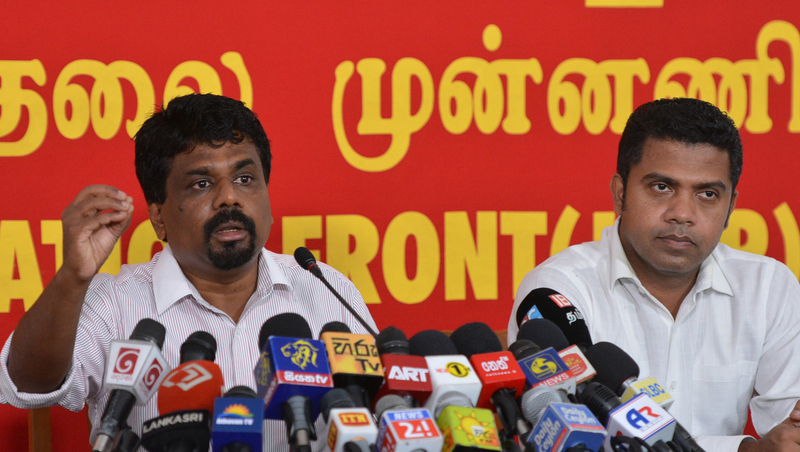 He said this speaking at a press conference held at the head office of the JVP at Pelawatta today (22nd) afternoon. The Member of the Central Committee of the JVP Kalutara District Parliamentarian Dr. Nalinda Jayatissa too was present. Speaking further Mr. Dissanayaka said, “When this government came to power it promised to arrest all those who were involved in frauds and corruption and to punish the guilty. 2 ½ years have passed since it came to power. The rulers have not been able to fulfill any promises they made to the people. They also reiterated they would find employment for youths. They promised to find ten million jobs. However, the government has failed to find suitable employment for youths. Also, they promised to salvage the country entrapped in a debt trap. However, the country is again trapped in a debt trap. Despite promising that the supremacy of the law would be established, it has been cast aside. Instead, drugs and crimes have escalated in the country. After 2 ½ years of rule Ranil – Maithri administration has proved the promises and agreements to the people have been broken down. The government should fulfill the needs of the people. Certain faculties of universities have been closed down for several months. There isn’t any solution yet. Children die when police exchange fire with the underworld. Prices of essential items have been increased burdening the people more. Fraud and corruption are rampant and the President and the Prime Minister, instead of solving issues of the people, have presented a play act called cabinet reshuffle to the masses. A statement published in the media said to have been made by the President after the reshuffle says their intention was to create new hopes among the people. These are hopes that would never be fulfilled. The intention of the cabinet reshuffle is not to prepare future programmes to develop the country and the people. There are several other goals in this reshuffle. One such goal is to create a crooked legitimacy for the SLFP to continue to remain in the government. The MoU between the SLFP and the UNP was for a two year ‘national’ government. However, they have been together for 2 ½ years and have approved all proposals that have been brought in. They are trying to create a legitimacy to remain in the corrupt administration until 2020. The second goal of the reshuffle is to please who are dissatisfied. Tilak Marapana had to resign from the ministerial post as it was revealed he was protecting Avant Garde fraudulent company. After that he never came to the Parliament for more than a few days. He was unhappy that he had to resign from the ministerial portfolio. He has been given the Ministry of Development Assignments to please him. Already, there are several ministers for development. Malik Samarawickreme is Minister of Development Strategies; Sarath Fonseka is Minister of Regional Development. Sagala Ratnayaka is Minister of Southern Development. John Seneviratna has been given a new Ministry called Sabaragamuwa Development. S.B. Dissanayaka is the Minister of Upcountry Development. In addition to all of them Tilak Marapana is appointed Minister of Development Assignments. Is there development in the country with all these ministers of development? These ministries are not for development of the country or the people but for their own development. Also, in the past John Seneviratna and S.B. Dissanayaka were grumbling. They have been gratified by adding several portfolios. As Mahinda Amaraweera is the Secretary General of the UPFA he has been given a state ministry as well. As such, the reshuffle is not for the development of the people or the country nor is it to solve the issues of the people. Someone can argue that there were allegations against the Minister of Finance and he had to be removed from that ministry. If there were allegations against him he should be investigated and he should be punished instead of giving him a new portfolio. This government has created a new system of punishments. It is to give the perpetrator a new ministry. There are rumours that Ravi is to be given plantations, insurance, Mahapola, Lotteries Board and several other enterprises in addition to Foreign Affairs. Then Ravi becomes Foreign Minister of Economic Affairs. Arjuna Ranatunga has been given the Ministry of Petroleum Resources Development. 1/4th of our export expenditure is for fuel. Why is a ministry with a transaction of nearly US$5 billion, a large number of personnel and a large number of retail outlets given to Arjuna Ranatunga who has allegations against him as the Minister of Ports? Also, despite Kiriella, being accused of having a large number of consultants, coordinating secretaries and committing irregularities in projects, carries on regardless. Nothing has happened to Siyambalapitiya who is accused of irregularities in coal tenders. Harrison who allowed middlemen to get profits by selling paddy stocks exists without any bother. The Prime Minister who protected bond fraudsters remains in his chair. Duminda, the Minister of Agriculture who wastes Rs.2.4 million monthly on rent for a building has nothing to worry. As such the reshuffle is not done to remove fraudsters or the corrupt. It has been done not for the development of the people or the country. Changing the Minister of Ports doesn’t change the attempt to sell Hambanthota Harbour or the East jetty of Colombo Harbour. Changing the Minister of Petroleum wouldn’t stop selling oil tank farm to India. The reshuffle would not change any policies of the government. According to the 19th amendment to the Constitution a resolution to have only 30 posts of ministers and 40 posts of state ministers was passed. When the SLFP and the UNP joined it was decided on 1st September, 2015 to increase posts of ministers from 30 to 48 and posts of state ministers from 40 to 45. As such, this government was formed to share posts and privileges. The cabinet reshuffle also proves it. 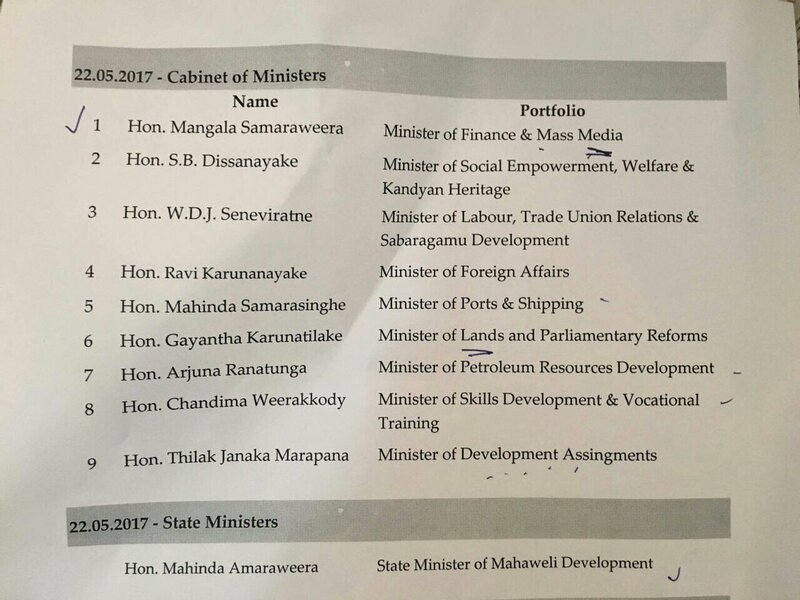 With this reshuffle the cabinet expands by adding a minister and a state minister. It is the people who have to be burdened with the extra expenses. This would be another addition to the economic crisis the country is already immersed in. The token strike organized by the GMOA has commenced. 5. Failure to carry out a methodical investigation in connection with the complaints made by GMOA to the Commission to Investigate Allegations of Bribery or Corruption and the CID regarding permission given to SAITM by the Ministry of Health to use government hospitals. GMOA also states the officials who intentionally avoid responding favourably to the aforementioned issues should be held responsible for any inconvenience caused to patients. Meanwhile, it has been decided not to carry out the strike action in maternity hospitals, children’s hospitals, cancer hospital, hospital of the three services and the kidney treatment units of hospitals. Also, doctors engaged in strike action today will keep away from private practice as well. A woman and two persons who are suspected of aiding and abetting the suspect involved in the shooting officers of police narcotics division at Piliyandala have been arrested. The 44 year old woman and 22 year old youths are to be produced before Kesbawa Magistrates Court today (22nd). A child and an officer of the Police Narcotics Bureau were killed when a team of Police Narcotics Bureau that carried out a raid for drugs in Piliyandala area on the 9th at 8.45 p.m. was shot at. Two more police officers and a civilian were injured in the shooting incident.